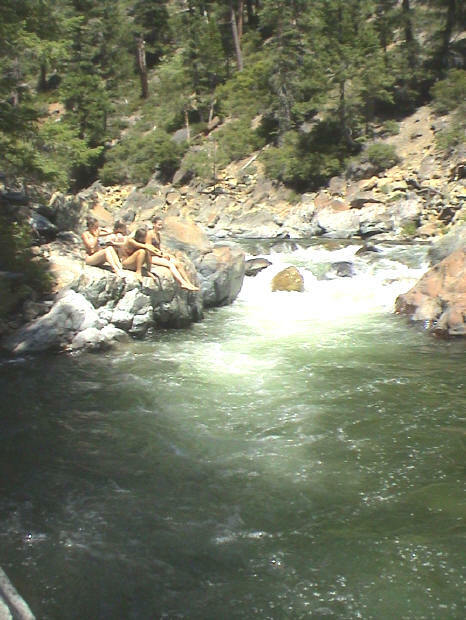 enjoy one of the most magnificent and diverse wilderness areas in California. Beth and myself, our friends, family and many guests. Supplying text and photos has been a "challenge"
because we are the only residents of the Trinity divide. but our only guides have been locals from 10 - 30 miles away. So ... we did the leg work and often with misdirection. road markers, and don't travel with maps (which are inadequate anyway). or rely on our perception of time and distance. We have also found that most people ... don't follow directions. This booklet is designed to help you reduce the likelihood of repeating our mistakes. It is free, but with no guarantees. Chances are, if your eyeballs are focused on this text you'll enjoy our effort. Enjoy your adventure, because that's what it is ! Print this map for your use. Use the following map to study the area on your computer. This is a 3 mile loop hike in from our front gate. 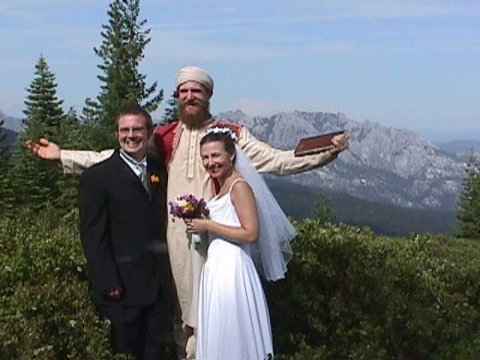 You should see Mt. 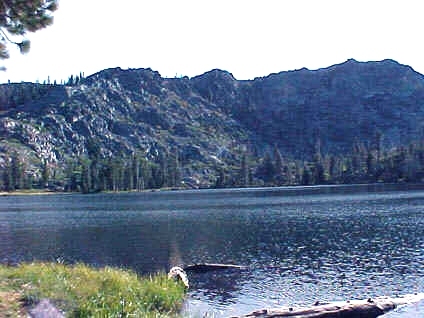 Shasta and Castle Crags (showing) to the North, Lassen 90 degrees to the East. Grey Rocks to the south and Bolder Peak (hike 4) to the West. From the front gate, go West (right) .3 miles on FR 25. Go East (left) and then take the first road to the south (right). 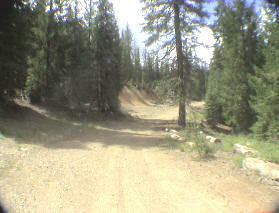 Follow the road past the small mud slide and gravel pit on the left. Walk .6 mile and take the first road to the East (left). Here are your instructions so far. take an immediate right. See auto above. mud slide on the left. Continue through the gravel pit area on left. Find the meadow on your right. 4. Then, take the trail on the left. Follow the trail to the saddle and then to the left. Continue to the top and enjoy the view. Continue down hill and take your first road to the West (left). and exit on to FR25 just East of our gate. Go West (left) approximately .2 mile to our gate. This is a 2 mile hike in from our front gate. You can drive much of the way if you wish. It's secluded with a big rock in the middle and no fish. Walk .6 mile and note the first road to the East (left). Continue walking on the main road .25 mile and take the road to the left. Stay on the road 1 mile to the end. Go West for aprox. 5 minutes and find the drainage from Pondgri-La. Follow the drainage South (toward Grey Rocks) to the pond. The Grey Rocks range is spectacular. and attract the attention of most geologist that visit. what you would do naturally from Pondgri-La ... climb. It is a 4-6 hour adventure with a wash off in Pondgri-La. This venture is a 2 or 25 minute drive West of our front gate. 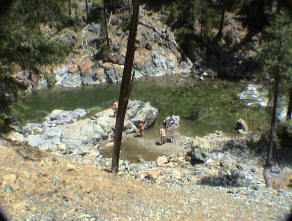 It’s a good spot for those wanting secluded swimming. Zero your odometer at our front gate. Don’t forget. Go West (away from Castella) on FR 25. 1. At 1.2 miles you will pass FR 26 to the North (right). Don’t turn, stay on FR 25. 2. At 1.8 miles you will pass a road to the South. It goes to Twin and Tamarack Lakes. Within ~ .5 mi look on the left for a tree struck by lightening. Bingo! This is a “wide” spot in the narrow road. This is an 8.5 mile drive from our front gate. This is a good spot for those wanting secluded deep wide pools with currents. You might want to bring an extra pair of shoes or thongs because you will walk through a river. Drive 7.5 mi. West on 25 and note the bridge to the South. (At 1.2 miles you will pass FR 26 to the North (right), stay on FR 25. At 1.8 miles you will pass the road to the South. Stay on FR 25 and drive approximately 1.2 more miles and find the wide parking area on the left. Park and walk SW (right) to the washed out road. Cross the water and follow the road approximately .5 mile to the only access on your left. This is a spectacular view! A friend quit hunting when he visited here. Salmon Mountains, Redwoods and the Russian Wilderness. Shasta and Lassen are also in view. Go West (right) apx. 1 mile and turn North (right on 26). At an apx. total of 4 miles, when 26 turns to the left, go to the right. At apx. total of 5 miles from our gate, you will find a 4 road intersection. Park and find the jeep trail to the NE. It's about 1 mile to the top. 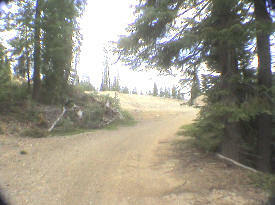 When you are close to the top you will have to take the trail to the left going up hill, not straight. This is an easy way to access the basin. From #4. The 7 Lakes Basin Lookout, drive North on the main road another 1.7 miles watching carefully for the turn off to the East (right). You might see the remains of an old gate. Turn East (right) and stay on this road for .6 mile where you can park. Walk another .4 mile to the saddle and continue into the basin. Two lakes you can drive into. 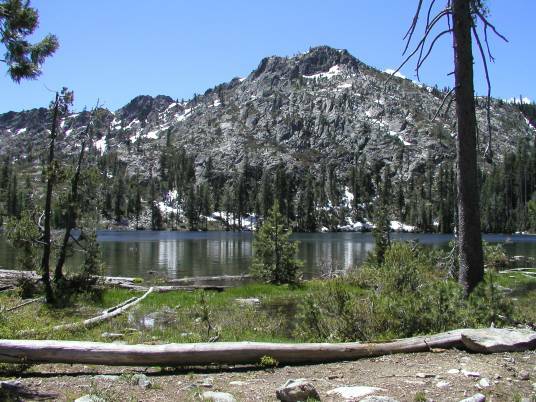 Hike the PCT into Seven Lakes Basin. Go west apx. 1 mile and turn right on 26. At an apx. total of 4 miles, follow 26 turns to the left. At about 7.5 miles from our gate, find the road on the right into Mumbo Lake. Shortly after the turn off is parking for the PCT trail head on the left. The trailhead is on the South side of the road. Hike South for about 45 minutes (2.25 mi.) and find the trail into the basin. The view is incredible. Note that you could have parked a vehicle at #5. 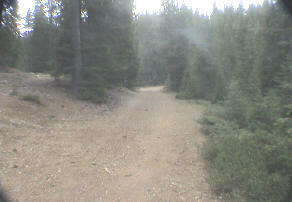 After the PCT is the turn off for Gumboot on the right (3.8 mi. ), and continue to Lake Siskiyou and Mt. Shasta. Upper Twin is a good fishing lake when the fish cooperate. There are some good size Rainbows and plenty of brookies. Pay attention: You will cross the first of three bridges .1 miles after you turn on to this road. The second bridge is about 3.4 miles from our gate. After the bridge stay on this road. Don’t take the inviting turn offs to the right (it goes to #9 Highland Lake). Soon the road turns sharply to the East (left) and you will find the third bridge. It is about 4.5 miles from our gate. You can park just past the 3rd bridge and hike into Tamarack (it is too rough for most vehicles). Several yards before the bridge is Twin Lakes Road on to the South (right). Enter and park immediately (it is too rough for most vehicles). Upper Twin is about 1.5 miles to the South. Follow the road for 1 mile and you will find a camping spot. 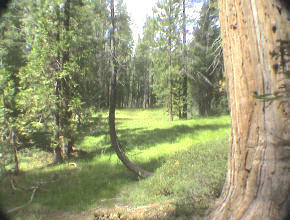 A large meadow is to your East (left) and the trail ends. The trail picks up if you continue walking straight ahead 100’ or so. Follow the trail to Upper Twin Lake. This is not an easy to find trail. Find the faint trail to the East of the Lake, or go due East on blind faith. Tamarack is less than .5 mile away. Find the trail on the North side of the lake. Be sure to mark your trail if you want to return to Twin Lakes. 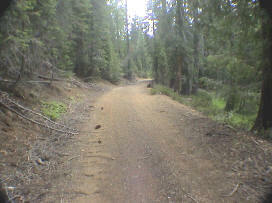 You can follow the “road” to the third bridge in a 2.5 mile hike for a total of 3.75 miles. This is a difficult to find Lake, making it very secluded. Good fishing and a reasonable shoreline. After the bridge, take the first right. At apx. 5 miles from our gate (1.7 miles from the turn off) you will find a bridge. Continue another .3 miles and note the turn off to the West (right). Don’t take it. Continue .9 mile and park at the gate. Then head West about .2 miles and find the Lake. Good Luck! Beautiful but ...this is a real adventure! You can try with this map but many new roads have been added. It is 1 hour from here if you go right to it. This was a productive gold mine where you can still find remnants and shards. Go East (left) .5 mi. and turn North (a hard left). Travel another 1.4 miles, take the short turn off to the East (right). Park and find Castle Creek to the East. Follow the drainage apx. .25 miles to the remains of the Ruby Pearl. 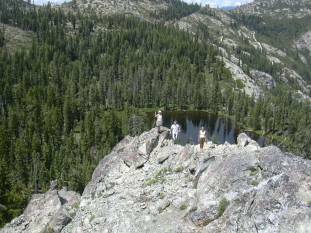 This trail takes you through the 7 Lakes Basin drainage. Travel another 1.4 miles and note the turn off to the Ruby Pearl mine to the East (right). Go another .2 mi. and note the sharp and steep turn to the West (left). 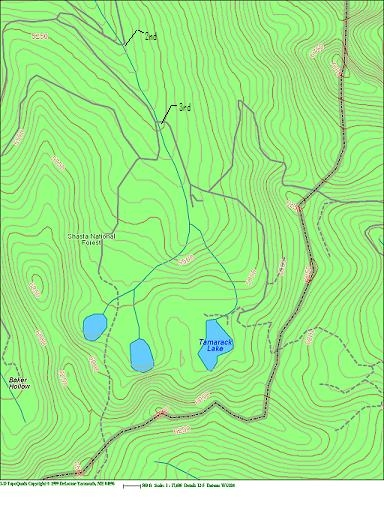 Walk .15 mi and find Echo Lake Trail to the East (right). Follow the trail up the drainage to 7 Lakes Basin. 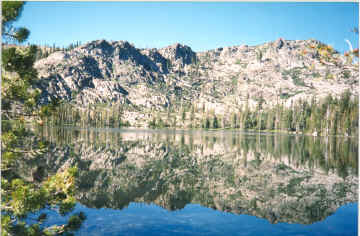 Echo Lake is privately owned. 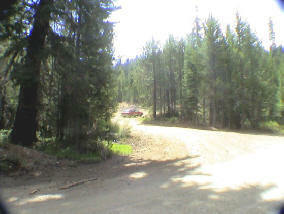 This is a National Forest scenic highway. 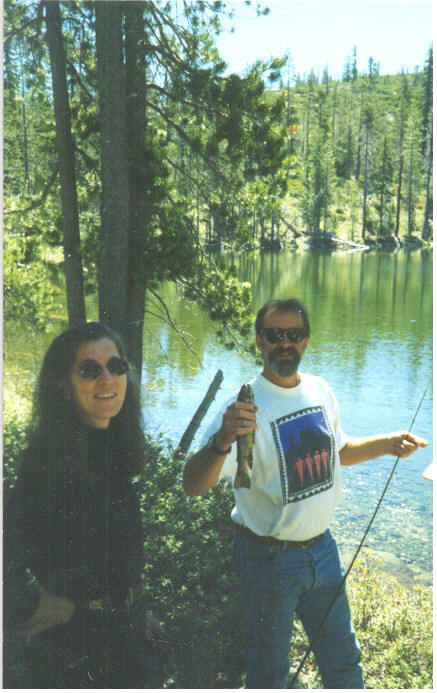 You will end up at Lake Siskiyou, the only lake in California built for recreation. You might be interested in the Fish Hatchery in town. At an apx. total of 4 miles, follow 26 as it turns to the left. Shortly after the turn off is parking for the PCT trail head on the left. After that is the turn off for Gumboot on the right. Keep on going on this great road until you reach Mt. Shasta. MORE THAN MEETS THE EYE - Shasta Lake, keystone of the Central Valley Project, is the largest man-made reservoir in California. When full, its 365 mile shoreline exceeds that of San Francisco Bay. 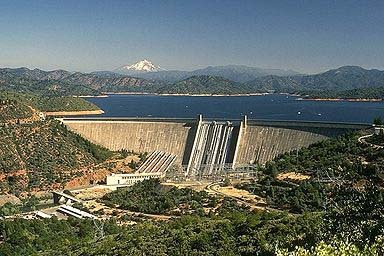 Shasta is the second largest and tallest concrete dam in the United States. It was constructed between 1935 and 1945, and the lake was filled in 1948. Geology of the Trinities Like to Fish?